Garden Street Early Learning Centre loves exploring their local community through regular excursions. Whether they are visiting the fruit shop, the local aged care facility or a nearby public school, the children enjoy meeting the community (and the locals love meeting them too!). Felix, Sienna, Aerlia, Audrey, Camille and Xavier all prepared themselves for our wonderful excursion by putting on sunscreen, going to the bathroom and ensuring they had a jacket and hat on. We chose a teacher to partner with and set off on our long walk. Along the way, we saw and discussed shops that seemed to be familiar with when out with our families (including the sushi shop) and we also walked past Hefron Park, where many of our friends attend swimming lessons at the swimming pool (Des Renford). We took in the beautiful sunshine and got in touch with nature along the way. 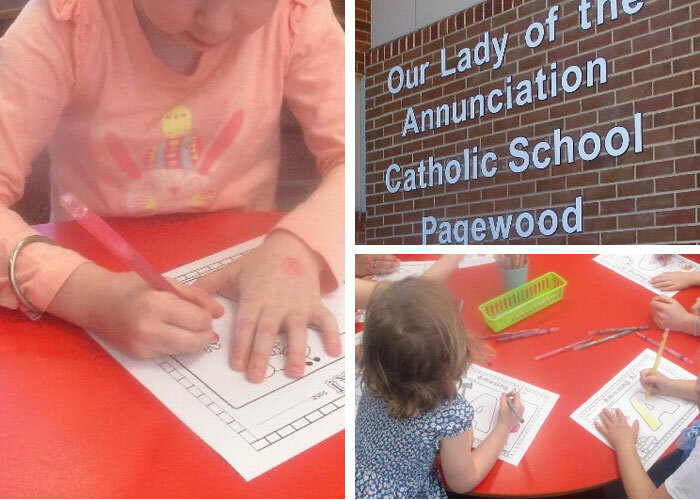 Once we got to Our Lady of Annunciation (OLA), we took some happy snaps and found our way into the Kindergarten room. Many of the kindy children and even the teacher recognised Sienna as her brother, Dylan, attends OLA. We said “hello” to our new ‘big’ friends and joined them in some literacy activities. We began by singing a literacy song, focusing on the letter ‘T’. 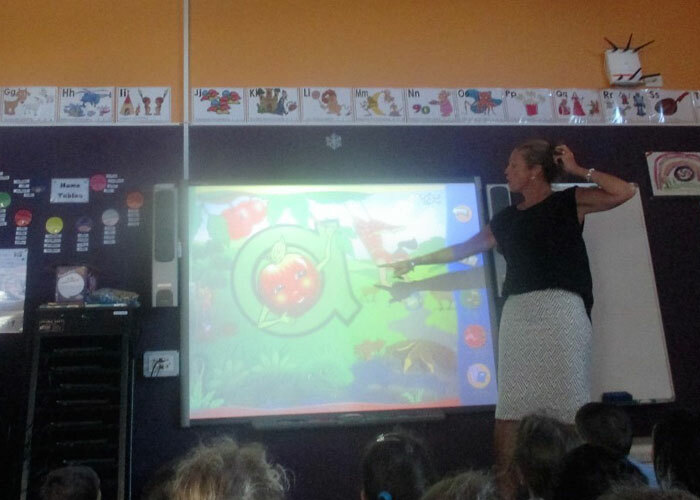 Our preschool friends joined in and even interacted with the smart board in order to find things that begin with the letter ‘T’. After singing, the class split up into literacy groups. One group was on the iPads playing literacy games, another group was cutting out a tree and piecing it together like a puzzle, another was independently reading and the last group was doing letter writing in their text books. Camille, Felix, Sienna, Audrey and Xavier began by cutting and pasting a picture of a tree together, focussing on following the dotted lines and thinking about what pieces match up together. Aerlia joined the older children in independent reading and then moved on to the iPads. It was then time to swap groups and each of our preschoolers tried something new. These activities were great for focussing on sounding out words and finding the letter that each word begins with. Our preschoolers were so impressive with their skills for learning and were complimented a few times by the kindergarten teacher. We played a quick game of musical statues where our friends were able to ‘shake their sillies’ out. Next was ‘crunch and sip’ where our preschoolers joined the primary school children to eat a healthy snack. It was time for us to leave and we thanked all our new friends and teacher and headed back to Garden Street ready to share our wonderful experience with our friends. Our excursion today was aimed at building confidence and ensuring our preschoolers became a bit more familiar with the routine and activities they will be participating in next year at primary school. We are so proud of our preschool friends who attended the excursion today and look forward to continuing our transition to school program with a variety of different incursions and excursions! Garden Street Early Learning Centre has a number of long standing educators who are passionate about giving children the best care possible. Centre Manager, Jenna Paulo has been at the centre for seven years and worked her way up from a Trainee, to a Room Leader, to Assistant Centre Manager and then to Centre Manager a year ago. There are also educators in the team who have been at the centre for over four years. This stable base provides consistency for children with our very experienced educators. Some of the most popular members of the Garden Street community are our hermit crabs who live in the preschool room. The children and parents love them and they provide valuable learnings for the children. Through caring for the hermit crabs, the children learn to show empathy, care and respect – not only for the crabs but toward each other and their environment. With a very convenient breakfast service provided to families between 7am and 8am, busy families can enjoy toast with Vegemite and/or cheese and cereal with their child. It’s a great opportunity to settle the child as well as interact with the educators and other families. Want to experience Garden Street Early Learning Centre for yourself? Head here to read more and to book a tour.